Wool Allergy? This mattress contains only the purest and finest layers of US-grown organic cotton through and through... no chemicals, no fire-retardants, no pesticides, no wool, nothing but organic cotton. It is created carefully in the most sterile manufacturing environment available today without bleaches, dyes or other unnatural treatments being conducted anywhere nearby. Constructed with a heavy duty innerspring that utilizes different coil gauges to give your body the proper balance and support, Choose from firm, extra firm or super firm. All Earthsake mattresses are free of chemical fire-retardants and we do not require a Doctor's Prescription to sell you one (though we will accept and fulfill a Doctor's Prescription with any of our mattresses) - go back and choose any of our other mattresses unless you have a rare and unusual allergy to wool when it is nearby even if it does not come in contact with you (ie. inside a mattress). We require a doctors prescription for this mattress only because without wool inside it does not meet the "cigarette-burn" fire safety test. Those who have an extreme allergy to wool (even when it never makes contact but is nearby) should have this noted on their prescription and buy a Wool-free mattress from Earthsake. All Earthsake mattresses are free of chemical fire-retardants and we do not require a Doctor's Prescription to sell you one (though we will accept and fulfill a Doctor's Prescription with any of our mattresses) - you can go back and choose any of our other mattresses unless you have a rare and unusual allergy to wool when it is nearby even if it does not come in contact with you (ie. inside a mattress). If that's the case order this Prescription-only Wool-Free Mattress which uses no other fiber but organic cotton. Its tempered steel innerspring is layered in organic cotton, then wrapped in organic cotton. These layers are then hand-tufted to a cover of organic cotton. 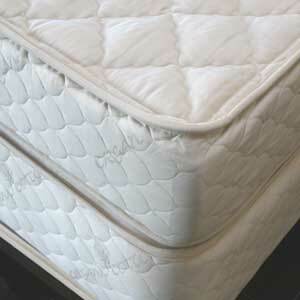 The organic cotton is grown in California and has no pesticides and no chemical treatments are used on this mattress. It passes the open-flame test laws for mattresses but it does not pass the cigarette-burn test, which is why we require a doctor's prescription for this mattress. The organic cotton boxspring does not need to pass the cigarette-burn test and therefore meets all required fire-safety laws without the use of chemicals or wool. Therefore, no Doctor's prescription is required for the wool-free organic cotton boxspring. • Heat-treated heavy-duty orthopedic innerspring unit layered and covered in 100% pure organic cotton!! 8" high mattress - Sizes: Crib (6"x27"x51"), Twin (38x75”), Twin-X Long (38x79”), Full (53x75”), Queen (60x79”), Dual-King (76x79”), and CA King (72x83”). 8'' high matching box spring - Sizes: Twin through CA King. Our PureGrow Wool fleece is completely chemical-free and uncarbonized unlike most wool and in our Cloud mattress it is underneath layers of organic cotton and a 100% organic cotton cover. It never comes in contact with you. Also, most allergic reactions to wool are to the carbonization process that most wool is subjected to - not ours. It is fleece only and cleaned with water - no chemicals or carbonization. We have had no reports of any allergic reaction to any of our products containing Organic PureGrow wool fleece - So if you have a Doctor's Prescription for a mattress with no fire-retardants you can click here to choose any of our mattresses - the best chemical-free Organic Cotton Mattresses out there - click here!